Most of you know that in January I lost the temp assignment (which was supposed to become a permanent position) at the worst possible time. I had had a very rough winter, complete with pneumonia, a sprained ankle, and acute bronchitis among other things, all of which resulted in a lot of missed work. Those of you who are also temps know that missed work = no pay, so you can imagine how much deeper my dark financial hole ended up getting. I lost my temp assignment a mere 10 days before my already backed up rent was due, and with no permanent job opportunities or even other temp assignments in sight, I began to panic. Because I'm good at what I do, I knew I'd be okay on food for a couple of weeks, but as far as shelter went, I had no idea what to do or where to turn. Fortunately, I listened to my mom who reminded me that as a taxpaying citizen, I did have the right to apply for public assistance to help me through this roughest of rough patches. I will admit that I was hesitant to do this at first. Why? I think I was scared that I'd be denied assistance and have absolutely nowhere to turn to from there. But mostly, I felt like I'd finally reached my rock bottom, having to ask for help when the past few years of financial hell had never forced me to do so. All this time I've just dealt with it: cutting corners, missing out on things I loved, wanted, and even needed, and getting as creative and resourceful as I possibly could. I have actually received some pretty nasty emails for saying that I had to "swallow the last 4 oz. of pride that I had" when I went to apply for public assistance from people who are obviously quick to judge a complete stranger without knowing her complete story. For me, it was not a case of being too "embarrassed" to ask for help, as some folks have assumed; it was a case of feeling like a personal failure because for the first time in my entire life, I found myself in a hole I couldn't crawl out of on my own. I had already cut back on anything and everything fun (just one asthma inhaler when I desperately need the other two; no more shopping for new clothes & shoes, things I do really need; no more concerts or road trips; no more new music; no more dinners out with friends). And I'd already sold everything I could sell without having to go without the bare necessities, which include my computer and my camera, things I actually do need in order to continue the one thing that has kept me going through all of this: my blog. With so many loyal fans & new readers everyday, folks who have actually written to me privately to thank me for bailing them out of one crisis or another, there was no way I could have chucked the two things that I needed to keep this thing going. I love what I do, love that I can help people. Quitting PGEW was not an option. And so I went. I walked the few blocks to my local Department of Health & Human Services office and started the application process that I so naively thought would result in some sort of immediate assistance. After all, I'd checked out the information online and realized I did qualify for both food stamps (now called SNAP: Supplemental Nutrition Assistance Program) and General Assistance. I'd called the office before going so I wouldn't waste a trip and was told all I had to do was fill out some forms and they could help me right away if I brought my ID and Social Security card. What they don't tell you is that you get to stand in line for a good 20 minutes (if you're lucky) and receive a giant stack of forms asking you for everything but your blood type. Then you get to stand in another line for another 30 minutes so you can turn in this stack of paperwork and be rudely instructed to sit down and wait for someone to call you back into their offices. After another hour or so of waiting, you have a brief 5-7 minute meeting with a social worker who finally tells you that you won't be getting any help today and hands you another slip of paper so you can stand in ANOTHER line that will finally result in an appointment time. For one week later. One week. 7 days of absolutely no income or even the hope of any assistance at all. My panic increased. I dealt with it, though. I had been given a large manila envelope full of more paperwork that was quite similar to what I'd already filled out at the office. I patiently filled everything out and spent the last few dollars I had to make copies of the documents they required at my local Kinko's. I made sure everything was filled out correctly so that I couldn't be denied for some minor error. With my large packet in hand, I went to my appointment 30 minutes early, again, to make sure I couldn't be denied for some trivial reason. I checked in and was told I might wait anywhere from 30 minutes to 6 HOURS to be seen. Strange, considering I had an "appointment". I now realize they should change that to "check in time", as I literally did wait 4 1/2 hours before I was finally called back to meet with my case worker. I was lucky to get a social worker that understood I wasn't there to milk the system, though she was brutally honest about the fact that I probably wouldn't get much in the way of GA. Again, not a good thing, considering my rent was my main concern (and all I got from that was $153. That doesn't even cover a couple nights at Motel 6, let alone real rent!). Finally, after 7 hours of waiting, picture-taking, fingerprinting, PIN selection and signatures galore, I was given the maximum amount of SNAP assistance for a single person: $200. I was shocked, considering I don't even spend that on groceries in a normal month anyway! Sadly, when I did some research later, I learned that the more people there are in a family, the less money is actually received. Here in California, the maximum amount of food stamp assistance for a 4 person family is a mere $668; nearly 17% less than what one would think it would be at the $200/single person rate. Still, it is a big help when you have absolutely nothing to fall back on. You ever just have one of those weeks or months when EVERY. SINGLE. DAY. is chock full of events or commitments or something random to do? June's been like that for me, and though I've enjoyed everything I've gotten to do, it's seriously making a dent in my PGEW time! I've cooked up new recipes, shopped at different stores, and started about a half dozen new posts, all in the hopes of bringing you some good stuff; alas, there are only 24 hours in the day and that’s not always enough. So to you and to my beloved little blog, I apologize profusely, and bequeath upon thee the 99-cent Store edition of the $25 Shopping Cart. Now, I hadn't planned on doing this particular project this way. I'd had every intention of heading to ye olde 99-cent Store on a day off or after work when I'd have time to look at every single can, jar and package slowly and carefully. But again, with the kind of schedule I've been keeping I had to make due with the warp speed edition that I did over lunch one day last week with Adam, one of my friends from work. He wanted to get more candy to fill his candy dispensers on his desk and I needed more cheap low-sodium soy sauce; it was the perfect lunch date (except for the clock ticking my super short 30 minute lunch break, of course). Sadly, they were out of the low-sodium soy sauce so I'll have to get that some other time. But even with the contraband chocolate AND the bag, I only spent $21.17 after tax! (I won't even tell you how much candy Adam got, but let's just say I'm glad this store exists because he'd be bankrupt otherwise!) This was definitely a fruitful venture, and I was able to stock up on some staples that were starting to dwindle. However, since this was an unplanned visit and I didn't have a detailed inventory of what I had at home so that I could build around it, I'm not going to post possible meal ideas until the next time I head there (which will be in the 2nd or 3rd week of July, if not earlier). Granted, I had a general idea of what was in my cupboards, but part of making the $25 Shopping Cart a success is knowing what you have and building on it creatively. For now, I'm just happy I didn't have to go completely tomato-less for another couple weeks, and that I finally have exactly what I need to finally bring that one dessert shot idea to fruition. New recipe coming tomorrow night, so stay tuned! I seem to have developed a serious cherry addiction this year. Now, this isn't really a new thing, as I've always loved them and literally grew up surrounded by cherries. We lived on the border between Santa Clara and Sunnyvale, California, and some of my fondest memories include trips with my mom to C.J. Olson's orchards (back before that giant condo development monstrosity killed off all the beautiful trees... *sigh*). There, we would buy as many luscious, dark red cherries as we could fit into the back of her car. We'd polish off about half a pound by the time we got home and proceed to make jams and other lovely desserts. Every year I try to buy at least one large batch of cherries to continue this tradition, but this year I seem to have gone a little overboard! It seems like every time I visit the farmer's market, I have to buy at least one pound of these sweet, juicy orbs of happiness. On this weekend's trip to my favorite under-the-freeway market I got a little nutty and ended up buying some Brooks & Rainiers (couldn't resist the super low price of $1.75/lb! And they were actually GOOD! ), among many other tasty fruits & veggies. I already had a fresh cherry granita in mind, but when I got home I realized I still had several gorgeous strawberries leftover from a super sweet find my mom & I had scored the previous weekend, not to mention one last box of blackberries. Combining all of these to make a sinfully sweet and gorgeous granita seemed like a fabulous idea, and it definitely was. This is a perfect summertime dessert and a nice alternative to the usual jams & preserves that most berries & cherries become during this season. And with a little careful shopping at your local stores and farmer's markets, this dessert is as refreshing for your wallet as it is for the palate. 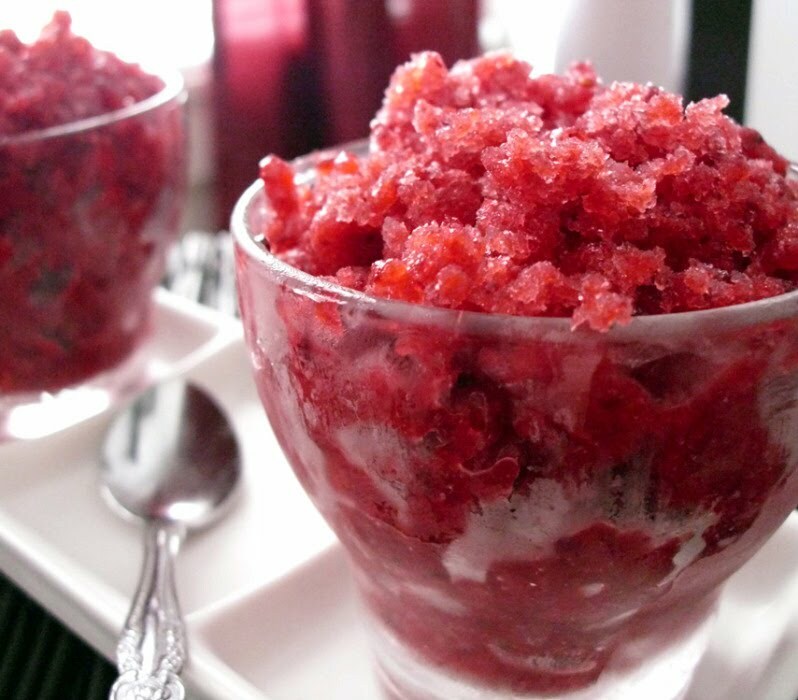 Combine the berries & cherries in a food processor and purée until almost smooth (leave a little texture to make things interesting). Quickly boil together the water and sugar until the sugar has dissolved. Combine the fruit purée and simple syrup in a large bowl and stir together well. Pour the mixture into a 9" x 11" metal pan and place in the freezer. After 30 minutes, scrape the edges toward the center of the pan with a fork and return to freezer. Repeat this process every 30 minutes until you end up with icy, flaky crystals of dessert. Serve with extra berries for garnish, store the rest in an airtight container and enjoy! Ms. Munchie of Munchie Musings is giving away four passes to the Sacramento preview of the 3rd installment in the Twilight series: Eclipse! I've been sharing this one a LOT on Facebook & Twitter, All you have to do is create an original recipe (savory or sweet) that's inspired by the books & movies and send the recipe and photos to Ms. Munchie by noon tomorrow (6/22). I know it's super short notice here on the blog (which is why it's so important to follow PGEW on Facebook & Twitter; this way you'll be on top of all the updates! ), but I'm sure you Sac Twi-hard foodies can whip up something awesome in no time! Yours truly will be one of the judges, so show me what you've got, Sacramento! I love seeing what other folks come up with. Click here for complete details & rules. The fine folks at SkinMD Natural are holding an awesome Backyard BBQ Giveaway, just in time for the 4th of July! The prize pack is incredible and a must have for the summer BBQ season! Valued at over $300, it includes 10 bottles of SkinMD (!!! ), hot dog & fry serving baskets, a 16 pc. cutlery set, insulated tumblers, wine charms, the Ultimate Barbeque Cookbook (w/over 300 recipes! 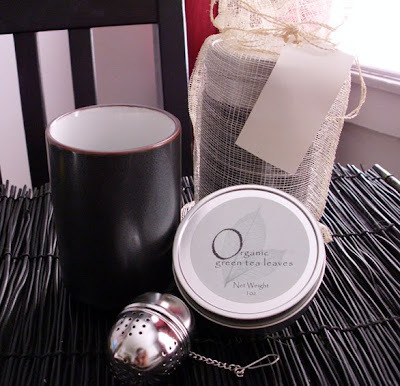 ), all0natural Caribbean burger blend seasoning, hickory wood smoking chips, candlholder, and more! Contest ends 6/25/10. I'm definitely entering because it's too good to pass up! Follow this link for rules and entry methods. Though I want to win this badly, I do love some healthy competition, so let's all enter Mezzetta's "Make That Sandwich" recipe contest! This is a big one, folks. The grand prize is $25,000 and a trip for two to the lovely Napa Valley (home of Mezzetta HQ). This year, they're also featuring 7 celebrity chefs who will be competing against each other to win a $10,000 donation to the winning chef's favorite charity! It's a huge contest but sounds like too much fun to pass up, so get your sandwich on! Simply go to www.makethatsandwich.com for rules and more details. FINALLY, yours truly is still holding the Wanchai Ferry VIP coupon giveaway along with MyBlogSpark.com! In addition to the great savings coupon, you'll also receive two lovely organic green tea sets, so it's great little prize. Contest ends this Wednesday, 6/23/10, so you still have a couple of days to enter, but I'd hurry if I were you! I've received over 50 entries and a ton of bonus Twitter entries, so the competition's fierce! To enter, check out the post for the Wanchai Ferry giveaway and follow the super simple rules. WHEW! That was a lot! Have a fabulous 1st day of summer and stay tuned for some new recipes this week! I've come to the conclusion that I have serious self-control issues when I’m at the farmer’s market. I’m surrounded with so much fresh, delicious produce, I tend to get a little euphoric and covet everything I see. Fortunately not only are farmer’s market prices nice & low but I have no car, so there’s only so much I can lug back home in my backpack and 87 reusable shopping bags from assorted stores. However, the lack of restraint thing always ends up making me resemble a human pack mule once I’m done shopping, no matter how little I’ve spent. The last time around was no different, especially because all sorts of wonderful summer veggies are starting to show up all over the place. I left with pounds of fresh produce, including the first baby squashes of the season, carrots, and the most ginormous fava beans I had EVER seen (they were even bigger than the ones I got during my Follow the Chef tour!). A ton of fresh herbs, greens and, of course, some sweet summer cherries, and I practically sprinted home to start playing with all this yummy goodness. The inspiration for this definitely came from the three gorgeous bunches of cilantro I was able to score for just $0.99. They were so fragrant and fresh that I immediately wanted to make a nice pesto with it. But when I got home I realized I had neither pine nuts nor almonds, two of the most commonly used nuts in pesto recipes. I was about to turn my cilantro into something else when I remembered I still had a giant bag of pistachios I could use, and voila! A tasty new pesto was born. It’s refreshing and almost a little tangy, and because this version uses no cheese whatsoever, even my vegan friends & readers can enjoy this. 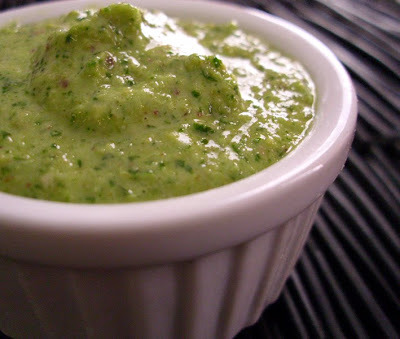 The pesto recipe will yield far more than what’s needed for the actual dish, but we all know how versatile pesto can be and you can certainly use this in anything and everything you want. I thought a nice place to start would be with some of the vegetables I’d picked up, along with some sort of grain. My first instinct was to serve this with couscous, considering how well regular pesto went with it in my Pesto Couscous Salad from earlier this year. Alas, I was all out, so I used the ever-so-handy Mother Grain: quinoa. 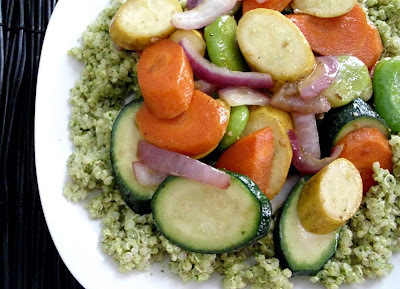 When all was said and done, I had a light yet filling dish packed with plenty of protein & fiber from the quinoa & veggies, as well as a ton of flavor from the pesto. 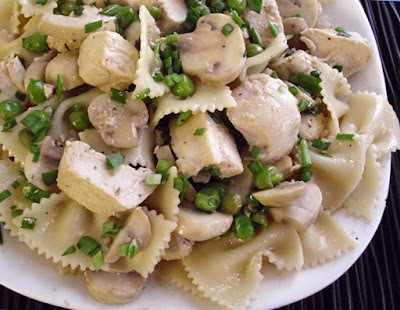 This is great as a side but also makes an amazing meat-free entrée that you can enjoy year ‘round. Quick, healthy, and super affordable – gotta love that! Combine the pesto ingredients in a food processor (or blender if you don’t have a food processor) and purée until smooth. Set aside. Slice the carrot, zucchini and summer squash into ½” thick pieces. In a large skillet heat the olive oil and garlic until the garlic becomes fragrant and golden brown. Add the sliced carrots and sauté over medium heat for about 2-3 minutes until they just start to become tender. Add the zucchini, summer squash, fava beans, thyme and salt & pepper and sauté for another 2-3 minutes. Finally, add the sliced onions and cook until tender. In a large bowl combine the quinoa and about 3 tablespoons of the cilantro-pistachio pesto and mix well (you may add more if you like a stronger flavor). Place in a couple of bowls or dishes, top with a generous amount of the sautéed veggies, and enjoy! So I've mentioned on Facebook that I'm having MAJOR insomniac issues this weekend. I'm not sure if it's because of the stress of my apartment building being sold and not knowing if I'll have a place to live, or if it's because I'm not sure if I'll have a job past the end of this month, but apparently Poor Girl's subconscious mind is dealing with some stuff that won't let her sleep. Still, my sleep loss is your gain and I've whipped up a few fun recipes that I'll be posting in the next few days (one of which will be posted later today). But despite the insomnia, I realized this morning that I absolutely HAD to eat something substantial before I got sick, so I decided to kill two birds with one stone and create a new breakfast recipe that I could share with everybody. As well as I did with my awesome food shopping last weekend, I have to admit I neglected to buy enough breakfast options. Sure, I have a few breakfast quinoa recipes I can whip out if worse comes to worst, but for a Sunday breakfast I like to have something a little more special. When I peered into the fridge I found I had very few eggs left, so I couldn't make the egg-filled crepes that I had originally been craving. Baked eggs seemed like a fun option but I wasn't really feeling the ingredient combos I could make out of what I had. However, I did find baby spinach, chives and the red potatoes I bought at last weekend's farmer's market, so I decided these could actually make a fun little frittata. Problem was, I only had 4 eggs. That does not a decent-sized frittata make! Unless it's a very tiny little frittata, and with some cute little ramekins in my kitchen, I knew I could make some pretty tasty, tiny breakfasts. 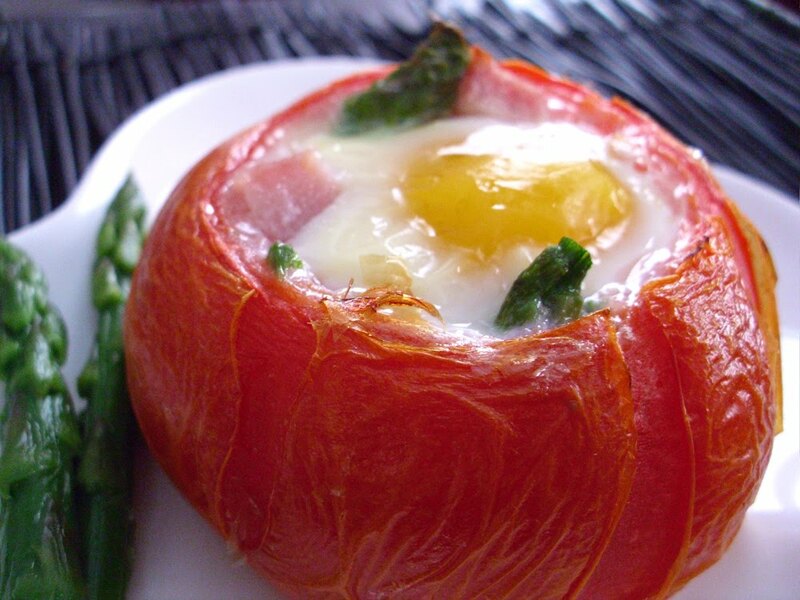 This is another great way to entertain any guests you might have over for brunch on a nice weekend, as they give a slightly nicer presentation than a standard frittata and definitely keep the portions under control. The best part is, you can make these out of just ONE medium potato? How many recipes can serve 3-4 people using just ONE potato? And don't let the small size of these little guys fool you, either; just one is enough to be satisfying, actually, and if you serve it with a side of fresh fruit and a slice of whole grain toast, you have a fabulous, perfectly balanced breakfast for just pennies. Gotta love that! Preheat oven to 350°. In a small skillet, heat 1/2 tablespoon of oil and add the diced red potatoes. 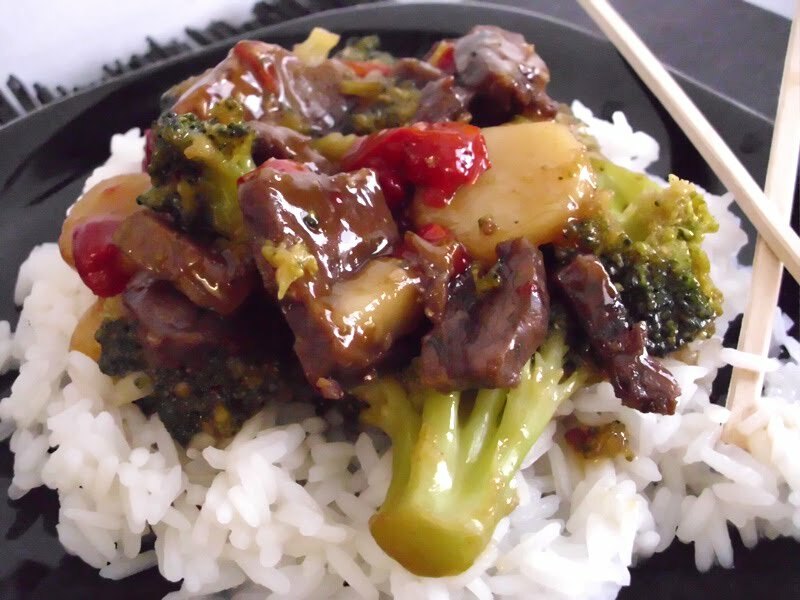 Sprinkle with salt & pepper and cook over medium heat until slightly browned and tender. Remove from heat. Grease four 3 oz. ramekins with the remaining bit of olive oil (you may not need it all; that's okay). Place equal amounts of the pan-fried potatoes in each dish, followed by equal amounts of chopped baby spinach. 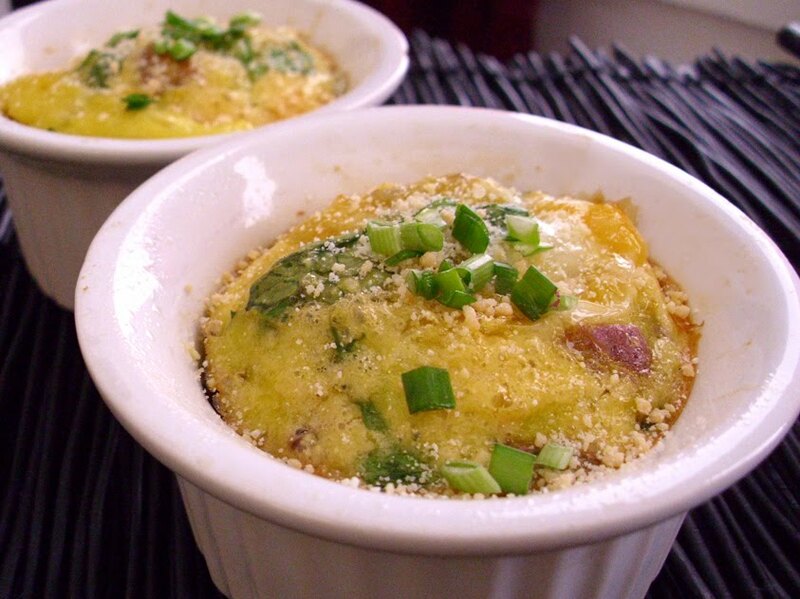 Lightly beat the eggs together with the parmesan cheese in a bowl, then pour equal amounts of egg over the spinach & potatoes in each ramekin. Place the ramekins into the oven and bake for 15-20 minutes or until the egg is set. Allow to cool for about 2 minutes, garnish with a tiny amount of parmesan and chopped chives, and enjoy! I want to start off by thanking all of you for your compliments and feedback on PGEW's new design & features! I'll admit I was a little nervous about putting it out there, especially when so many of you dear readers have been following since the very beginning and have gotten used to things around here. But it was definitely time for a change, and I'm so glad that my goals of easier post reading and ease of navigation were reached with the new design. It looks like summer might actually happen this year! That means I'll be out & about and heading to the farmer's market a LOT more than I've been able to all year. Just like last year, I'm hoping to experiment with a few ingredients I like to eat but have never cooked with before, so look for some new fruits & veggies to show up in June's recipes. With the warmer weather also come the "cool" dishes! I'm thinkin' more granita, more popsicles and more soup. Soup? Of course! I haven't had a good gazpacho in forever, so I'm hoping I can score tomatoes for that towards the end of the month. We're right in the middle of cherry season and I'm LOVING it! Hopefully you've all been able to score some Brooks or some sweet little Rainiers over the past couple of weeks. If not, don't fret! The fine folks at Whole Foods Market wanted me to let you know that they're having a fabulous cherry sale this month! 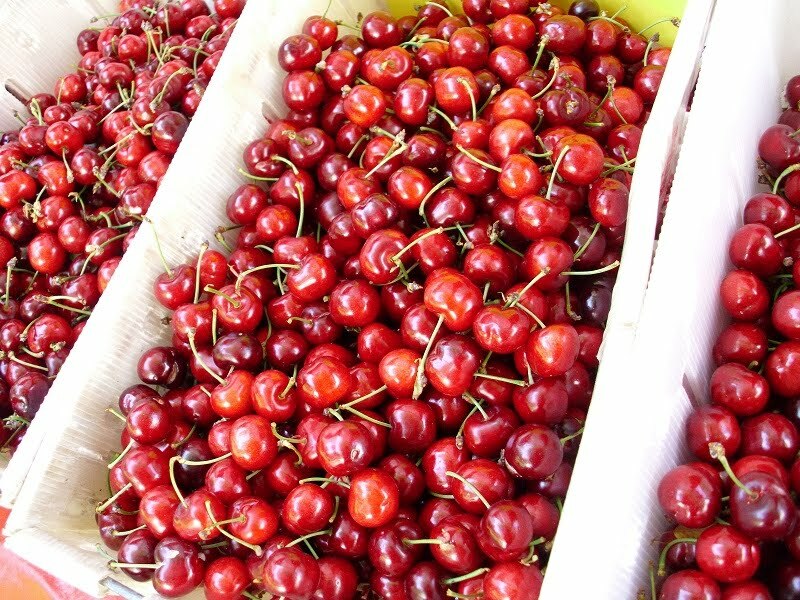 For 1-day only on June 18th, all Whole Foods Markets across the country will be selling cherries at just $1.99/lb! An incredible deal, indeed! I'll be sure to remind all of you via Facebook & Twitter as the sale date approaches. Speaking of fun through social media, if you haven't become a PGEW Facebook fan (or a "liker" as they like to call it now; I prefer "fan") or a follower on Twitter, be sure to do so when you get the chance! 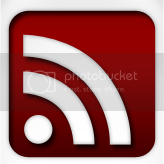 It's a great way to stay connected and get a lot of updates on sales & what's going on in PGEW land when I'm not actually on the blog. That's it for now, folks! Stay tuned for a new recipe today or tomorrow, and for a BIG announcement in the next couple of weeks. Since this Memorial Day weekend was every bit as lovely as we locals had hoped, most folks were out and about enjoying the warm weather and the extra day off. From activities along the river to the annual jazz festival, to simply getting out and enjoying the sunshine in one of Sacramento's many parks, the capital city was buzzing with activity. Of course, that included the official start to the BBQ & grilling season, and no matter where you turned someone was grilling sausages, hot dogs, burgers - you name it! My area of Downtown Sac smelled like one giant bacon-wrapped sausage most of the weekend, and it inspired me to crawl into evil closet and whip out my tiny little grill. Now, I am not the biggest griller. It's not that I don't like it, I'm just not so sure I'm always doing things properly. Still, I love any excuse to be outside when the weather's as great as this past weekend's, and I truly love the flavor BBQing and grilling can give to almost any food. Especially steak! I know most folks like to do the traditional burgers & hot dogs scene, but throw some lean steak or some skewered shrimp on my grill and I'm much happier. 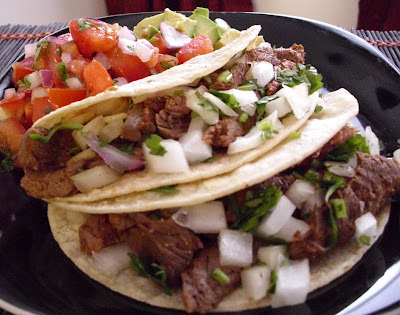 Fortunately, I had some small packages of flank steak defrosting in my fridge and decided the best way to enjoy said steak was to turn 'em into tacos. I made my own makeshift carne asada-esque marinade so the steak would be super tasty, and I even whipped up a fresh batch of pico de gallo for the occasion (Poor Girl SCORED on pico-makin' materials at the farmer's market this weekend!). All I needed was a nice sangria to complete my meal; alas, I had to make due with what I had (LOTS of ice water, lol). Place all the marinade ingredients into a large bowl and whisk together until completely combine. Add the steak, making sure to coat each side with the marinade, cover with plastic wrap and marinate in the refrigerator for about 2-3 hrs (overnight is great if you have time!). Prepare the grill by preheating to medium high and brushing the grill with a small amount of oil to prevent the meat from sticking. Remove the steak from the marinade. Grill the steak for just a couple minutes on each side (otherwise it will get too tough) and remove from heat immediately. When the steak has cooled for a couple of minutes, chop into bite sized pieces or strips. Warm the tortillas on the grill or on a dry skillet or pan. Place about 1/4 - 1/3 cup of grilled steak in each one and add plenty of chopped onion & cilantro. 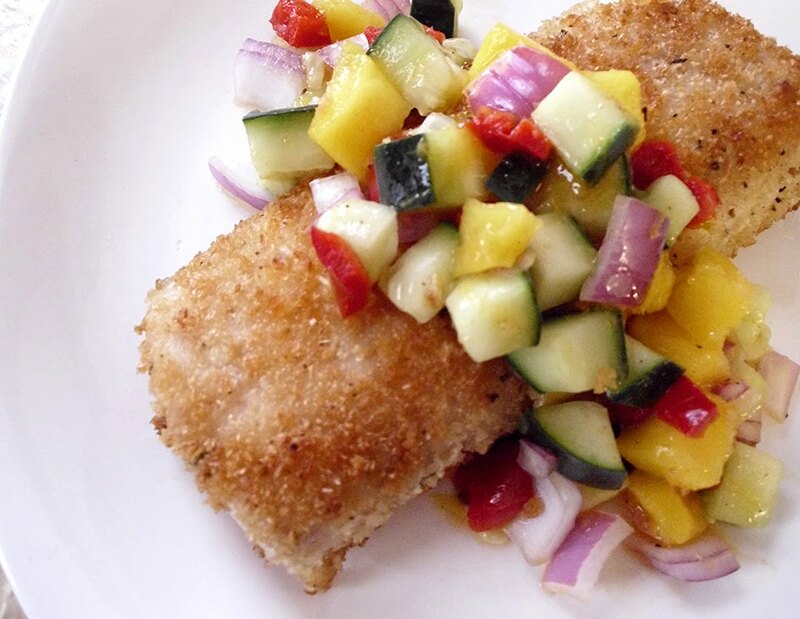 Serve with avocado cubes, pico de gallo and fresh Key lime wedges, and enjoy! TIP: For the softest, taco-ready tortillas, sprinkle a couple drops of water on each side of the tortilla before warming. The steam will make them super soft and ready for all the meat & fixings! In case you're rubbing your eyes in confusion right now, don't fret! Thine eyes doth not deceive - Poor Girl Eats Well just finally got its makeover! *cue applause* I'd like to thank all of you for being so patient and putting up with my whining & complaining (particularly those of you on Facebook & Twitter; you're all champs!). Creating the new look wasn't as much of an issue as making the darn thing work, but I'm happy & proud that I finally got it to work. There are some definite changes but I think you should still feel right at home despite the facelift. As you can see, I didn't completely let go of my favorite blue background. How come? A) Once I made the announcement that the look would be changing, a lot of you actually wrote back saying you'd miss the cool background; and B) I love my blue! I think it's part of what makes PGEW unique and I didn't want the changes to be too drastic (I had a very scary white layout going on for awhile...). However, the changes that have been made should make both reading and navigating PGEW a lot easier. The new menu bar makes things a lot easier to get around PGEW! Major categories like About PGEW, Recipes, Tips, Reviews, Press, etc., all have their own tab now, making certain posts more accessible. Recipes & Tips are further broken down into sub-categories, which should help cut back on searching for things on the site. You can still search for posts by label, but even that's a little more streamlined as you can now search by ingredient or by post/label type. NEW features include the Basic Recipes & Methods and the Glossary. I created these with the novice cook in mind, in order to help take some of the mystery away from certain terms used on PGEW. I've received a lot of feedback from folks who are either new to cooking or new to a lot of the less common ingredients I use in my recipes, so I figured having these very basic guides on the site would be quite helpful. NOTE: These two features are still works in progress, so stay tuned for more info on each in the next few months! I hope you all like the new look & features! It's not a huge change but just enough to keep things interesting around here. :) If there are any broken links or other issues, please let me know so I can get them fixed right away. Don't forget to stay tuned for a new recipe based on this weekend's backyard adventures!